A diesel generator is the combination of a diesel engine with an electric generator (often an alternator) to generate electrical energy. This is a specific case of engine-generator. A diesel compression-ignition engine often is designed to run on fuel oil, but some types are adapted for other liquid fuels or natural gas. Diesel generating sets are used in places without connection to a power grid, or as emergency power-supply if the grid fails, as well as for more complex applications such as peak-lopping, grid support and export to the power grid. Sizing of diesel generators is critical to avoid low-load or a shortage of power and is complicated by modern electronics, specifically non-linear loads. In size ranges around 50 MW and above, an open cycle gas turbine is more efficient at full load than an array of diesel engines, and far more compact, with comparable capital costs; but for regular part-loading, even at these power levels, diesel arrays are sometimes preferred to open cycle gas turbines, due to their superior efficiencies. The packaged combination of a diesel engine, a generator and various ancillary devices (such as base, canopy, sound attenuation, control systems, circuit breakers, jacket water heaters and starting system) is referred to as a "generating set" or a "genset" for short. Set sizes range from 8 to 30 kW (also 8 to 30 kVA single phase) for homes, small shops and offices with the larger industrial generators from 8 kW (11 kVA) up to 2,000 kW (2,500 kVA three phase) used for large office complexes, factories. A 2,000 kW set can be housed in a 40 ft (12 m) ISO container with fuel tank, controls, power distribution equipment and all other equipment needed to operate as a standalone power station or as a standby backup to grid power. These units, referred to as power modules are gensets on large triple axle trailers weighing 85,000 pounds (38,555 kg) or more. A combination of these modules are used for small power stations and these may use from one to 20 units per power section and these sections can be combined to involve hundreds of power modules. In these larger sizes the power module (engine and generator) are brought to site on trailers separately and are connected together with large cables and a control cable to form a complete synchronized power plant. A number of options also exist to tailor specific needs, including control panels for autostart and mains paralleling, acoustic canopies for fixed or mobile applications, ventilation equipment, fuel supply systems, exhaust systems, etc. Diesel generators, sometimes as small as 200 kW (250 kVA) are widely used not only for emergency power, but also many have a secondary function of feeding power to utility grids either during peak periods, or periods when there is a shortage of large power generators. Ships often also employ diesel generators, sometimes not only to provide auxiliary power for lights, fans, winches etc., but also indirectly for main propulsion. With electric propulsion the generators can be placed in a convenient position, to allow more cargo to be carried. Electric drives for ships were developed prior to World War I. Electric drives were specified in many warships built during World War II because manufacturing capacity for large reduction gears was in short supply, compared to capacity for manufacture of electrical equipment. 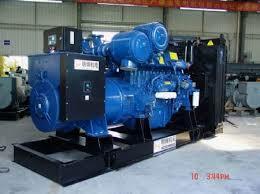 Such a diesel-electric arrangement is also used in some very large land vehicles such as railroad locomotives. Generating sets are selected based on the electrical load they are intended to supply, the electrical load's characteristics such as kWe, kVA, var, harmonic content, surge currents (e.g., motor starting current) and non-linear loads. The expected duty (such as emergency, prime or continuous power) as well as environmental conditions (such as altitude, temperature and exhaust emissions regulations) must also be considered. Generators must provide the anticipated power required reliably and without damage and this is achieved by the manufacturer giving one or more ratings to a specific generator set model. A specific model of a generator operated as a standby generator may only need to operate for a few hours per year, but the same model operated as a prime power generator must operate continuously. 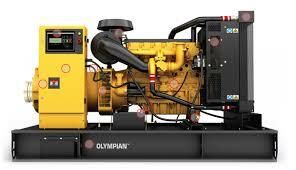 When running, the standby generator may be operated with a specified - e.g. 10% overload that can be tolerated for the expected short running time. The same model generator will carry a higher rating for standby service than it will for continuous duty. Manufacturers give each set a rating based on internationally agreed definitions. These standard rating definitions are designed to allow correct machine selection and valid comparisons between manufacturers to prevent them from misstating the performance of their machines, and to guide designers. Standby Rating based on Applicable for supplying emergency power for the duration of normal power interruption. No sustained overload capability is available for this rating. (Equivalent to Fuel Stop Power in accordance with ISO3046, AS2789, DIN6271 and BS5514). Nominally rated. Typical application - emergency power plant in hospitals, offices, factories etc. Not connected to grid. Prime (Unlimited Running Time) Rating: Should not be used for Construction Power applications. Output available with varying load for an unlimited time. Typical peak demand 100% of prime-rated ekW with 10% of overload capability for emergency use for a maximum of 1 hour in 12. A 10% overload capability is available for limited time. (Equivalent to Prime Power in accordance with ISO8528 and Overload Power in accordance with ISO3046, AS2789, DIN6271, and BS5514). 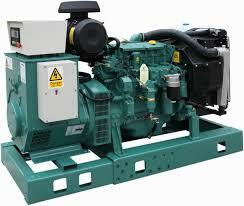 This rating is not applicable to all generator set models. Typical application - where the generator is the sole source of power for say a remote mining or construction site, fairground, festival etc. Typical application - a generator running a continuous unvarying load, or paralleled with the mains and continuously feeding power at the maximum permissible level 8,760 hours per year. This also applies to sets used for peak shaving /grid support even though this may only occur for say 200 hours per year. As an example if in a particular set the Standby Rating were 1000 kW, then a Prime Power rating might be 850 kW, and the Continuous Rating 800 kW. However these ratings vary according to manufacturer and should be taken from the manufacturer's data sheet. Often a set might be given all three ratings stamped on the data plate, but sometimes it may have only a standby rating, or only a prime rating. Typically however it is the size of the maximum load that has to be connected and the acceptable maximum voltage drop which determines the set size, not the ratings themselves. If the set is required to start motors, then the set will have to be at least three times the largest motor, which is normally started first. This means it will be unlikely to operate at anywhere near the ratings of the chosen set. Many gen-set manufacturers have software programs that enable the correct choice of set for any given load combination. Sizing is based on site conditions and the type of appliances, equipment, and devices that will be powered by the generator set. Starting systems - key start, pull start, button start - lots of options.